Have you had a girl friend, who you are just so close to, that you should have been sisters? Well, I am blessed to have a few of those. Two of my 'sister' make their own cards and sell them. Shocking, huh? that we know each other. 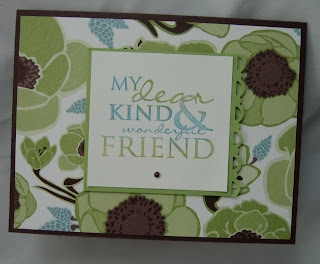 Anyway, they have started their venture with Stampin' Up! and I wanted to send them a quick & easy card to both congratulate them individually, and have a sample card on hand. Sometimes, your eye just likes clean and simple. You know what I mean? Sometimes, extra stuff, is just too much stuff. Thank you for looking! Please leave a comment, as they always make me smile. And Congrats to B. & S.! You both will do a wonderful job! Hi Sharon; thanks so much for leaving me such a great comment on my coffee sleeve tutorial! Please email me a link to your sleeve when you make it! I'm glad I inpired you!